Once again, a Presidential announcement about offshore oil development has sent the media and environmental advocates into a spasm of headlines and press releases that presumes the words being uttered in DC actually reflect on-the-ground (or in this case, under-the-waves) reality. In late 2016, there was effusive praise for an effectively symbolic Obama decision to not offer leases in Alaskan and Atlantic waters (AEI’s “much ado about not much” post questioned the prevailing celebratory outburst). Fourteen months later, we’ve got a mirror-image outcry over Trump’s base-pumping proclamation about “unleashing America’s offshore oil and gas potential” through a National Outer Continental Shelf (OCS) Oil and Gas Leasing Program for the years 2019-2024. Sure, that’s just the ticket; these eager beavers can’t wait to dominate a fading industry—a decade from now, since that’s how long it takes to get offshore wells on line. And so begins a two-year planning process that will needlessly and expensively repeat the one just completed in 2016. For we already have a National Outer Continental Shelf Oil and Gas Leasing Program, with a finalized plan set to run from 2017-2022, which the government (both federal and states), oil industry and energy consulting firms, and environmental groups spent two years and who knows how much money to complete. As always, these plans are revisited, revised, and occasionally overhauled every five years. But this gang may not be around in 2021-2022 when it’ll actually be time to once again jump into this particular vat of no-fun-for-anyone. So let’s just tear it up and do it all again now! A couple of recent studies have added to the increasing evidence that anthropogenic ocean noise can have deleterious effects on fish. As the years go by, it’s becoming clear that it’s not just whales and dolphins that are struggling with human noise in the sea. A lab-based study of European sea bass found that recordings of pile driving sounds (often associated with bridge, port, or wind farm construction) and of drilling sounds triggered subtle yet troubling changes in behavior. The sudden bursts of pile driving induced a startle response, while both kinds of sounds increased stress, as measured by the fishes’ respiration rate. In addition, both sources of human noise appeared to suppress their normal predator inspection behavior, which could make them more susceptible to predation (though after a half hour of drilling noise, the bass returned to normal anti-predator behavior). At the quieter spring sites, the mean communication distance was 15 meters (below 11m during the noisiest 10% of the time, and over 19m at the quietest 10% of times), while in the winter sites, they could only be heard out to 2.7 meters (with 10% extremes of under 2.1m and over 3.4m at the very best of times). 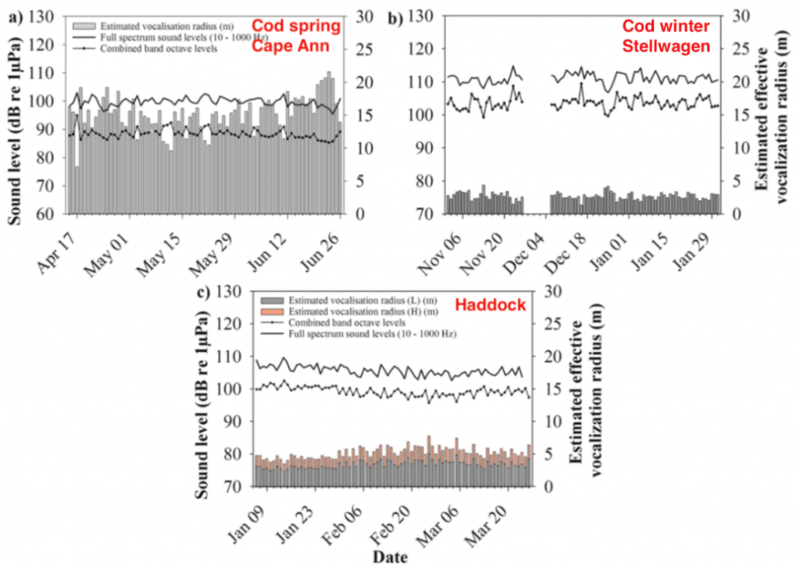 The haddock spawning sites had intermediate noise levels, and at their loudest could be heard at slightly longer range than the winter cod, though a weaker form of their call had the shortest range of any of those assessed. Mounting evidence suggests that acoustic communication can affect the survival and reproductive success of fishes, including direct evidence for Atlantic cod. . . .Unlike haddock who have a wide acoustic repertoire, Atlantic cod are thought to be less versatile vocalists during courtship. . . If anthropogenic sound reduces the efficiency of the vocalizations utilized by these species, this interference could potentially impact their reproductive success and survival through the incorrect assessment of the quality of potential mates or competitors, reduction in the ability to attract mates and/or the mistiming of gamete release. This research highlights the need to gain a better understanding of the spatial and temporal use of unique habitats that are predictably used for critical life history events in declining populations. Identifying and better understanding these consequences [at all levels of the food chain] is important to advancing the management of shared acoustic space. Last fall’s innovative 2-month voluntary slow-down of ships traveling to and from the Port of Vancouver was successful on one count—average overall shipping noise was reduced by 44%—but a stark absence of the normally abundant resident orcas stymied the equally important second line of inquiry: how would reducing the noise level, but spreading more moderate noise over longer time periods, affect orca behavior? About 60 percent of the ships transiting Haro Strait complied with the voluntary speed restrictions; even this level of participation succeeded in reducing the overall level of ship noise by 2.5 decibels, very close to the 3dB target set by the International Whaling Commission a decade ago. Thanks to the logarithmic scale of decibel measurements, a 3dB reduction amounts to cutting the sound energy in half. This is great news, a real-world confirmation that the noise of global shipping can be reduced relatively easily—albeit by increasing transit time. 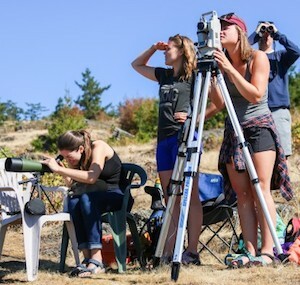 Piloting his 31-foot research boat Wishart back to Seattle from the San Juan Island study site, Rob Williams mused on his 20 years studying killer whales. “A whole lot of science has been done already,” he said. It may be time to start making some difficult policy decisions about vessel noise, Williams said, and that means weighing safety issues and economic tradeoffs alongside concern for the whales. A number of factors, including the Canadian government’s approval of Kinder Morgan’s pipeline to export oil to Asia, could drive future increases in Port of Vancouver vessel traffic.